My research focuses on understanding the habitat requirements of pond-breeding amphibians, as well as on expanding the ways in which effects of habitat loss can be measured and monitored. Wetlands themselves have gained some protection in recent years, however many wetland organisms, including amphibians, rely heavily on the terrestrial upland. It is crucial to the protection of native wetland species that we understand both the quantity and quality of terrestrial habitat required to support a healthy population. Many pond-breeding amphibians, particularly Ambystoma species, can live for a decade or more, and this long life span can make traditional population studies challenging. Developing alternative techniques that can supplement, or in some time sensitive cases, replace traditional population studies may aid in the relatively rapid identification of at-risk populations, as well as enable the implementation of more effective management strategies. To that end, I am currently planning several experiments including a long-term population study of a pond-breeding salamander (A. maculatum) and several studies of potential rapid assessment techniques for identifying populations at risk of severe decline or extinction at local ponds. Homan, R.N., M.A. Holgerson, and L.M. Biga. 2018. A long-term demographic study of a spotted salamander (Ambystoma maculatum) population in central Ohio. Herpetologica 74:109-116. Homan, R.N., J.R. Bartling*, R.J. Stenger,*, and J.L. Brunner. 2013. Detection of Ranavirus in Ohio, USA. Herpetological Review 44:615-618. Homan, R.N. 2018. Relationships between local climate variables and spotted salamander phenology differ for early versus median breeders. North American Congress for Conservation Biology. Homan, R.N. 2016. A decade-long demographic study of a Spotted Salamander population in central Ohio. 101st Annual Meeting of the Ecological Society of America. Reding, J.A., G.R. Smith, J.E. Rettig, R.N. Homan, D.J. Spieles, T.D. Schultz, A.C. McCall, and B.J. Sodergren. 2016. The Granville Schools Land Lab: A K-12/College/Government Teaching and Research Collaboration. 101st Annual Meeting of the Ecological Society of America. Homan, R.N., J.R. Bartling*, R.J. Stenger*, and J.L. Brunner. 2013. Detection of ranavirus in five amphibian species among three Ohio ponds. 98th Annual Meeting of the Ecological Society of America. Homan, R.N. 2012. Fluctuation and Stability: A seven year study of spotted salamander demography and migratory orientations. Ohio Amphibian Research and Conservation Conference. Homan, R.N. 2011. Multiyear demographic study of three co-occurring pond-breeding amphibian species. 96th Annual Meeting of the Ecological Society of America. Rumschlag, S.L*, T. Lan*, and R.N. Homan. 2010. A pilot study examining the role of conspecific chemical cues affecting juvenile American toad (Bufo americanus) orientation behavior. 95th Annual Meeting of the Ecological Society of America. Homan, R.N., M.A. Atwood*, A. Dunkle*, and S.Karr. * 2009. Multi-year study of adult and juvenile Wood Frog and American Toad migration orientations. 94th Annual Meeting of the Ecological Society of America. Homan, R.N., C.D. Wright*, L.F. Michael*, and S.A. Edwards*. 2007. Distribution of Ambystoma maculatum among different habitat types surrounding a single breeding pond. 92nd Annual Meeting of the Ecological Society of America. Homan, R.N., C. D. Wright*, and D. Walker*, 2006. Correlates of location and movement of Spotted Salamanders (Ambystoma maculatum) in the breeding pond. Joint Meeting of Ichthyologists and Herpetologists. Wright, C. D.* and R.N. Homan, 2006. Demographic correlates between upland and wetland usage in Ambystoma maculatum. 115th Annual Meeting of the Ohio Academy of Sciences. Homan, R.N., B.S. Windmiller, and J.M. Reed, 2004. Demographic clues about differences in relative vulnerabilities of two sympatric Ambystoma species. 18th Annual Meeting of the Society for Conservation Biology. Homan, R.N., B.S. Windmiller, and J.M. Reed, 2003. Critical Thresholds Associated with Habitat Loss for Two Vernal Pool-Breeding Amphibians. 17th Annual Meeting of the Society for Conservation Biology. Newcomb Homan, R., B.S. Windmiller, and J.M. Reed, 2001. Demographic Consequences of Upland Habitat Loss on Two Ambystoma Species in Eastern Massachusetts. 86th Annual Meeting of the Ecological Society of America. Newcomb Homan, R., B.S. Windmiller, and J.M. Reed. 1999. The Effects of Upland Habitat Loss on two Species of Mole Salamander (Ambystoma laterale and A. maculatum). Joint Meeting of the American Society of Icthyologists & Herpetologists, American Elasmobranch Society, Herpetologists League, and Society for the Study of Amphibians & Reptiles. Tyler Billings (’19): Comparing corticosterone concentrations in male Ambystoma maculatum from variable terrestrial habitats. Alexandra Lake (’18): How surrounding land use influences amphibian & macroinvertebrate diversity and pond characteristics at the Denison Golf Club, compared to the Denison University Biological Reserve and the GIS Land Lab. Robert Stenger (‘13) - Spatiotemporal variation in microhabitat characteristics of spotted salamander habitat. Justina Bartling (‘13) - First detection of ranavirus in Taylor-Ochs Pond and American toad tadpole susceptibility. Mark Mangus (‘12) - Investigating the factors influencing migration orientations of the wood frog. Eric Stachura (‘12) - Habitat distributions of four life stages of the spotted salamander in and around a temporary ponds. Tian Lan (‘11) - American toad and spotted salamander juveniles’ ability to detect and orient toward conspecific chemical cues. Joe Freundlich (‘11) - Multiyear study of three pond-breeding amphibians in Taylor-Ochs. Samantha Rumschlag (‘10) - Amphibian habitat use: demography at an undisturbed pond and a pilot study for juvenile orientation behavior. Meredith Atwood (‘09) - A multiyear survey of amphibian demography and habitat distribution at a vernal pool. Kyle Renaldo (‘09) - Continued exploration of local small ponds: Examining amphibian populations and habitat type. Brian Slaby (‘08) - Upland habitat use by a breeding population of Ambystoma maculatum (Spotted Salamanders). Sarah Karr (‘08) - An Exploration of the Larval Stage of the Spotted Salamander (Ambystoma maculatum). Gretchen White (‘07) - Third year survey of a breeding population of spotted salamanders and their habitat. Sarah Edwards (‘06) - A survey of the migrating breeding population of spotted salamanders at the Taylor-Ochs pond in the Denison University Biological Reserve. Dawn Walker (‘06) - Correlates of upland and wetland habitat use by spotted salamanders (Ambystoma maculatum). Christian Wright (‘06) - Demographic correlates between upland and wetland habitat characteristics for a breeding population of Ambystoma maculatum (Spotted Salamander). Lindsay Michael (‘05) - A survey of a breeding population of spotted salamanders and their habitat. Asso. Prof. Rebecca Homan turned her love of animals into a career as a professor and researcher specializing in amphibians and reptiles. 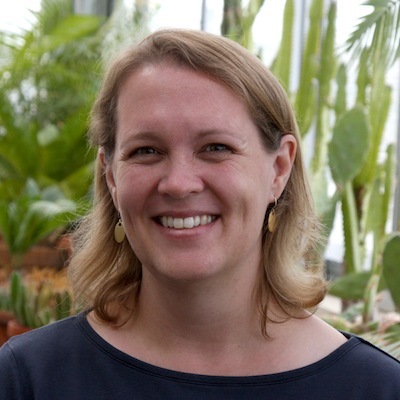 Rebecca Homan, Denison University associate professor of biology, has been honored with the 2017 Charles A. Brickman Teaching Excellence Award.